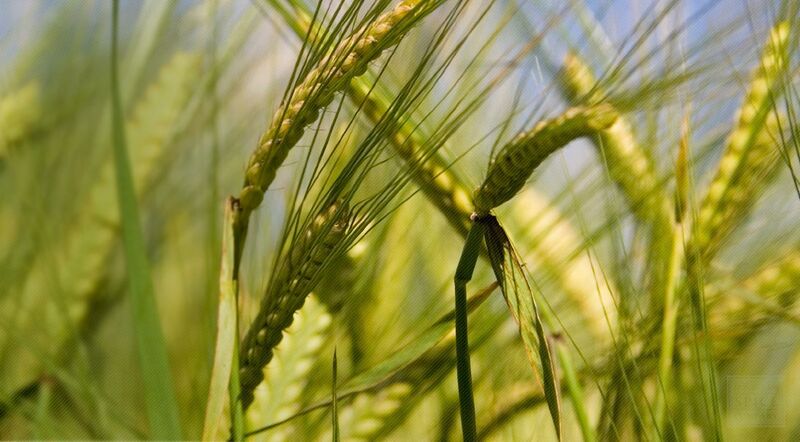 Barley is a plant in the grass family cultivated as cereal grain. The plant is high in fiber, vitamins and minerals and lends a nutty flavor to foods and beverages. Powdered barley is easily used in cooking and can also be made into capsules or pills. Hordeum leporinum is indigenous to the Mediterranean region. The species is a forage plant in the southern USSR, Argentina, and in portions of Australia. It is thought to have been introduced to North and South America, and to Australia, by the early nineteenth century. In North America, wild barley can be found from Maine and British Columbia to northern Mexico; it is absent in most midwestern states. Hordeum leporinum is a many branched, spreading, or nearly prostrate vigorous Winter annual herb, 15 to 60 cm high. It is a monocot of the Poaceae family. The seed, carried in florets, breaks from the head in groups of three. This dispersal unit consists of a central, fertile floret and two lateral, sterile florets. The glumes of the central spikelet and the inner glumes of the lateral spikelets are more or less broadened and flattened with hairs along their margin. The floret of the central spikelet is on a pedicel usually as long as the pedicels of the lateral spikelets, but the awns of the central spikelet itself are shorter than the lateral awns. The awn is 1.5 to 2.5 cm long, stiffly erect and spreading. Within the spikelet, the anthers are 0.8 to 1.5 mm long with a strongly bilobed base. The Old English word for 'barley' was bære, and is cognate to the Latin word farina "flour". The word barn, which originally meant "barley-house", is also rooted in this word. Hordeum leporinum is highly adaptable and often found in temperate and adjacent subtropical areas, annual grasslands, oak savannah, open hillsides, agronomic crop fields, orchards, vineyards, landscaped areas, turf, managed forests, roadsides, unmanaged, disturbed sites, and moist sites. Hordeum leporinum grows in disturbed soil of roadsides, irrigation ditches, vacant lots, crop edges, and garbage areas, usually considered a weed pest. Can grow on a variety of soil types, from clay to well-drained soil. Hordeum leporinum is a vigorous winter annual. After flowering in the spring, the grass matures rapidly to produce a large number of viable seeds. These seeds easily disperse when the long awn attaches to stock and wildlife, and then to the soil. The majority of seeds remain dormant during the heat of the summer, not germinating until the autumn. Sow seeds directly on outdoor soil, seeds can germinate easily when lying on or just below the soil surface in a variety of temperatures. Germination is usually within 12 days. A small proportion of seed may remain dormant, but viable, through the first growing season, insuring a seed source for the following year. Cut just above the soil when the Grass is 6 -14 inches. In commercial production, juice is extracted from the young leaf blades and dried, then ground into a powder. Store ground powder in a cool, dry place. Barley Grass (Hordeum leporinum) is a type of annual grass native to Europe, Africa, and Asia, but widely distributed and naturalized in various other regions of the globe. As a subspecies of H. murinum, barley grass is also commonly known as mouse barley and hare barley. While this self-seeding plant may prolifically crop up each year unassisted, it has apparently done so under the watchful care of human hands as well. In fact, according to the archives of agronomy, the science of using botanicals for food, fuel, and fiber, barely grass has been cultivated as a food source for thousands of years. For instance, Roman gladiators freely consumed barley grass to ensure strength and endurance in battle, while the ancient Greeks revered the plant as being a gift from the gods. One of the reasons this straw-colored grass is so successful is that it is highly adaptable to nearly any climate and environmental condition. In fact, it fares just as well in dry, rocky terrain as it does in cool, damp wetlands. The fully matured plant also produces a grain shaft, the seeds from which are easily transported by wind, birds, and passing feet to further its geographic reach. However, it is the young tender shoots that are most prized since this where the greatest nutritional benefit resides. First, barley grass provides a significant amount of fiber, including a water-soluble form known as beta-glucan. One of the greatest nutritional benefits of supplementing with barley grass is the fact that its nutrients are more bioavailable than other sources. For example, nutrients from many other sources must first undergo an enzyme conversion before they can be absorbed. In contrast, barley grass provides several enzymes and 18 amino acids, making this conversion unnecessary and nutrient absorption maximized. Barley grass is also an excellent source of protein. In fact, the fresh juice contains up to 45% protein. However, being a non-animal source of protein, it is low in fat. Barley grass is also rich in iron, folic acid, beta-carotene, and vitamins E, B1, B2, B3, B6, and B12. If that’s not impressive enough, then consider this: Barley contains 11 times more calcium and 30 times more vitamin B1 than cow’s milk, 5 times more iron than spinach, and about 7 times more vitamin C than an orange. Your mother may have told you to eat your vegetables but, if heeding her advice is difficult for you, this is one green food that makes it easy to get all the nutrition your body needs and more. You don't have to chomp on the grass in a meadow either. Barley grass powder is made available by extracting the juice from young plants at their nutritional peak, which is then carefully dehydrated and ground. All you have to do is simply add some barley grass powder to a glass of water or to cooked foods.